Have you visited Bonefish Grill lately? You may find a new favorite on their Spring Menu! 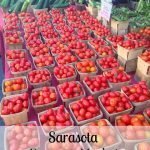 Get a peek at my experience and see what’s in season. 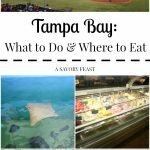 Bonefish Grill provided me with a complimentary dinner in exchange for sharing my experience in this post. All opinions are my own. Are you trying to decide what to do for dinner tonight? 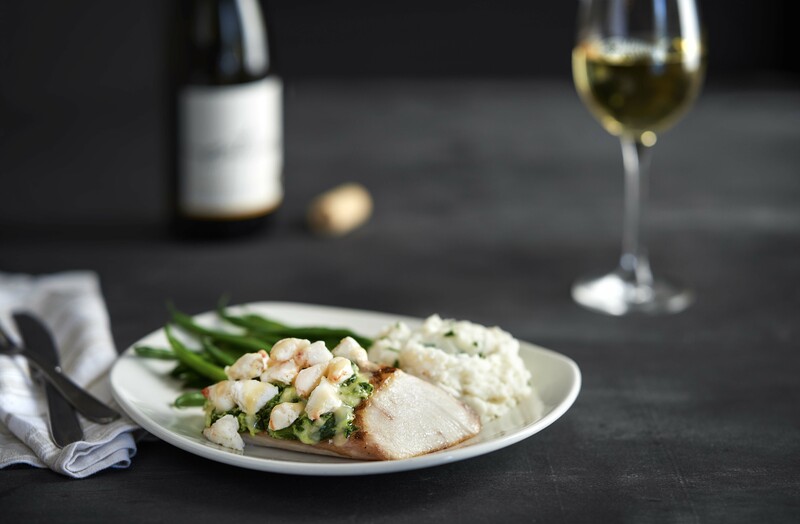 How about visiting your local Bonefish Grill and trying something off of their Spring menu? I love finding restaurants that offer seasonal menus featuring the freshest ingredients. While their entire menu is packed with delicious dishes, you’ve got to try some of their Spring menu items before it’s too late. 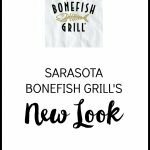 Last week my husband and I visited the Sarasota University Parkway Bonefish Grill. One of the things we love about Bonefish is how well they treat their customers. Every time we go, we feel like we are going to an upscale restaurant because of how well we are taken care of. On this visit, our server Megan did such a great job of suggesting menu items and went above and beyond to provide a wonderful experience. Since I’m pregnant and couldn’t try the seasonal martinis (which sound amazing, by the way! ), she suggested the spirit-free Fresh Blackberry Smash. It was delicious! It was almost like having a mixed drink. Once we ordered some drinks, we decided on a couple of appetizers. Of course, we had to get the Bang Bang Shrimp! 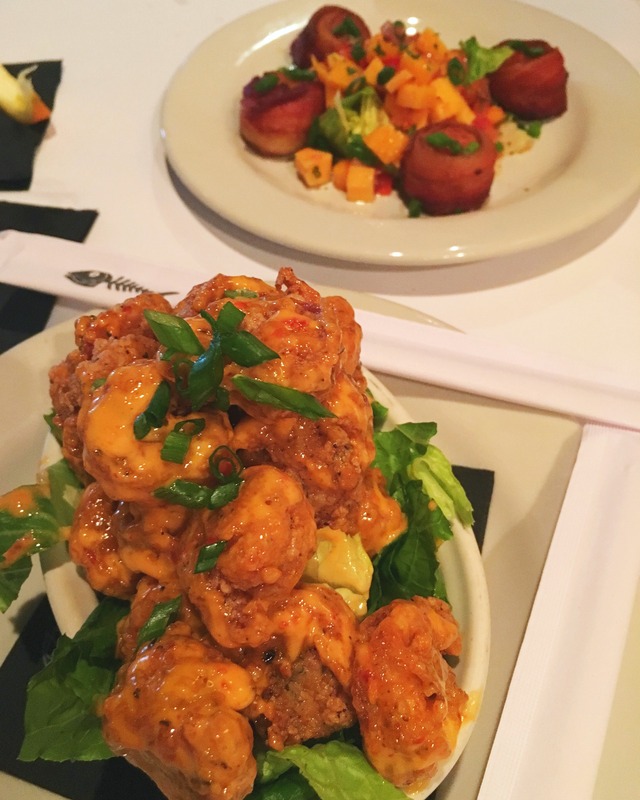 It’s our all-time favorite appetizer at Bonefish Grill and we talk about it all the time. We also ordered the Bacon Wrapped Shrimp Starter off of the Spring menu. I’ve made this dish at home, but it’s never this good! The bacon was perfectly cooked and complements the scallops wonderfully. Eating each bite with a little bit of the mango salsa adds just the right amount of sweetness and flavor. Andrew ordered Kate’s North Atlantic Haddock for his entree. He let me try some and it was my favorite of the two entrees we got. The crunchy crumb coating is what makes this dish incredible! It has such a great texture. For my entree, I ordered the Rockefeller Atlantic Cobia. The Rockefeller topping is made up of creamy spinach and lump crab. It’s absolutely delicious and goes great with a side of mashed potatoes. By this point we were both very full, but we couldn’t resist trying something for dessert! 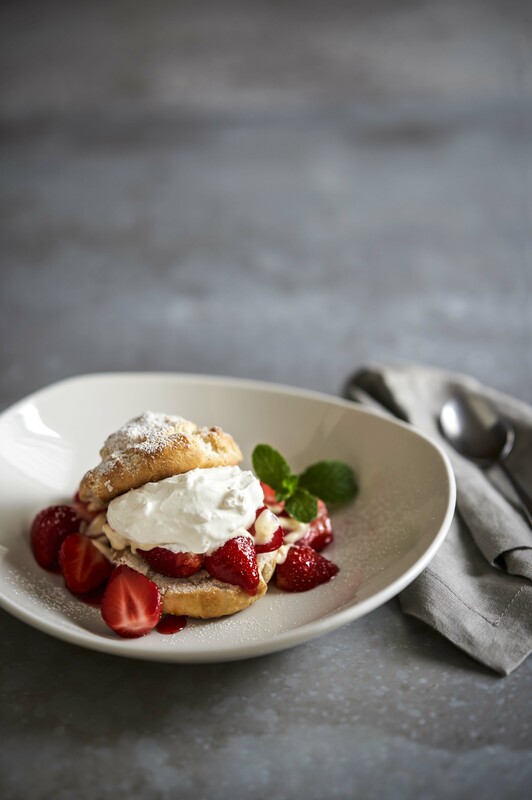 Lately I have been loving fresh strawberries, so the Fresh Strawberry Shortcake caught my eye. The best part of this dessert was the créme anglaise. It brought everything together and really made the dish. This is probably my all-time favorite strawberry shortcake! 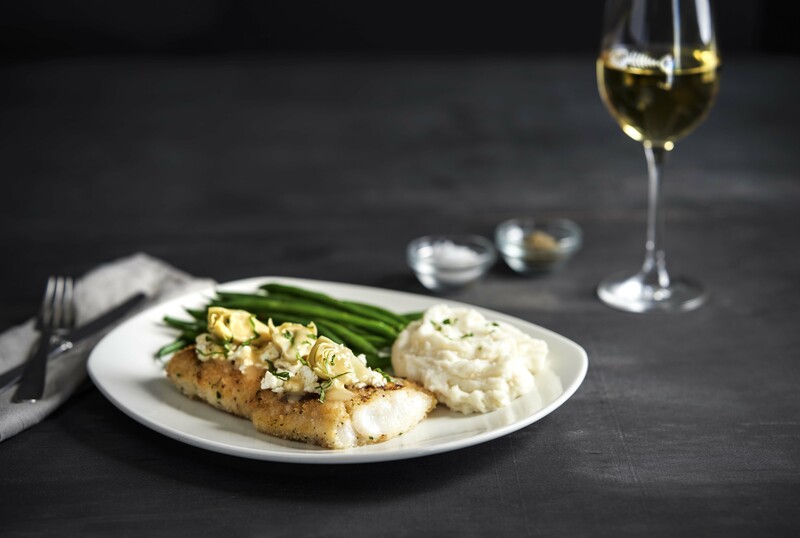 Have you visited Bonefish Grill lately? 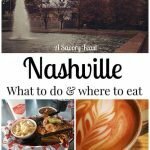 What are some of your favorite menu items? All of these Spring items look delicious. The shrimp are a definite favorite of mine as well. Also, that dessert.. omg yum! Bonefish is just so good! I’ve been craving it again already. Time to go back!